Guillaume’s skating season is now over. However, the athlete continues his chronicle. 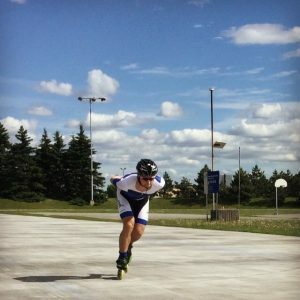 Guillaume does diferent kind of training as short track skating, rollerblading and about 400km of bike per week. His goal is to take part in the Canadian Olympic selection that will take place in December 2017 and January 2018. “It will not be easy, but I know it’s possible. I’m training even harder than before in order to be part of Canada’s elite in speed skating, “he said. It is the entire Zamboni team that warmly encourages Guillaume for the Olympic selection!